... Me. I should update these pictures: I have much less hair now, and perhaps a slightly better playing style!! But I still have not plastered the hole in wall behind me. How I envy those who grew up speaking Tamil! It is so hard for an Englishman to move his tongue fast enough for proper morsing playing! Even many regular concert goers do not understand how this instrument makes sound: by itself it makes no sound, held lightly but firmly against the front teeth makes your mouth its sounding box and, given the konokol as the basic the expression you can then give with mouth tongue and breathing is up to you. Right from the start you have to give it your personal expression, not just play the lesson as it is given by your teacher but, of course, you have to understand the lessons first! Actually, my hand does not look good here! You should see a gap between first and second finger. The secret of a good sound from the kanjira is to keep the note low by wetting the skin, but, beware: too much water and it becomes too loose and you can't play it at all. Gamuka is given by applying pressure with the finger tips of the left hand which stretches the skin and raises the pitch giving that splendid 'gulp' sound. Kanjira players move so fast it makes me think of butterflies wings beating . 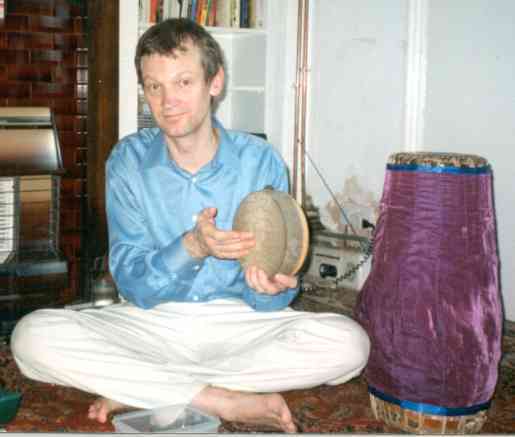 Of course, the Mridangam, the finest best, most subtle of all percussion instruments is nearby! This one, my first, was given to me. A truly life-changing gift!